Q. What is Keyhole Surgery ? Keyhole surgery, which is also known as 'minimally invasive surgery', has sometimes been referred to as the greatest surgical advancement since anaesthetic since its introduction which came about as information technology made tiny cameras which could be inserted into the body working alongside computers possible. Q. What Does Keyhole Surgery Entail ? Depending upon the area of the body where keyhole surgery is being performed, about 3 or 4 tiny incisions (sometimes even fewer), usually only around 10mm each, are made into which a special channel or tube is inserted. This is known as a 'port' and via this port, a special viewing instrument called an endoscope is passed through. This will have a powerful light source on the end of it and will work like a telescopic camera projecting images from inside the body onto a TV monitor which the surgeon can look at so that he can see exactly what the problem is and what needs to be fixed. In addition to the camera, the surgeon can also pass one or a series of specialised, miniature surgical instruments through either the same port or a different port (which would require a further incision(s) depending upon the procedure which is being carried out. The technology means that the surgeon can operate the equipment from outside of the body whilst looking at the monitor. Endoscopes vary in size and design depending upon the area of the body which is being operated on. Some are rigid and others more flexible and you may be familiar with the term 'laparoscopy'. This originates from 'laparoscope' which is the specialised tool used to perform keyhole surgery within the abdominal area. Q. What Procedures Can Be Performed Using Keyhole Surgery ? As the technology becomes even more sophisticated, it has been adopted as the recognised procedure for a whole range of surgery which would have previously required you to be opened up with a traditional scalpel. 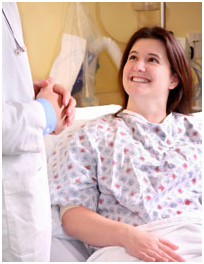 The extent of the surgery will determine how soon you will be able to go home after the operation. However as an example, where cruciate ligament replacement surgery would previously have meant you'd remain in hospital for a week or even longer, with keyhole surgery it is normal to go home after an overnight stay or after 2 days at the most. Scarring is minimal and any open wound should heal very quickly. As this is a general article encompassing the whole keyhole surgery spectrum, it's not appropriate to second guess how long it would be before you could go back to work and resume all of your normal activities. Suffice to say, however, that any keyhole procedure will enable you to recover more quickly than any traditional method of surgery which would have been used previously. Your GP or surgeon will be able to offer you more advice about keyhole surgery and whether it's an option for your particular condition and they will also be able to answer any further questions you may have as well as being able to provide you with leaflets and other information. "You need an operation." The moment these words are uttered most patients are struck by panic and anxiety. Images of large wounds, stitches, pain and a long hospital stay keep them away from the surgeon, usually until complications set in. What's changed now? Advances in medicine that allow major surgeries to be performed through an opening the size of a keyhole - "Keyhole Surgery". In Laparoscopic or Keyhole Surgery a telescope is introduced into the body cavity through a 0.5cm opening. The area is viewed through a CCD video camera attached to the monitor. Surgeons can perform any type of surgery by viewing the monitor. Because of the smallness of the opening, this kind of surgery is called Keyhole Surgery, Minimal Access Surgery, or based on the equipment used, Laparoscopic or Endoscopic Surgery. Small Incision, Minimal Pain and No Large Exposure - so chances of infection are almost nil. Keyhole surgery is cosmetically acceptable and allows quick recovery - You're back in the gym after a major Laparoscopic Surgery in 24 hrs. Reduced blood loss : reduces the chance of needing a blood transfusion. Smaller incision : reduces pain and shortens recovery time. Less pain : so less pain medication needed. Reduced infections : due to reduced exposure of internal organs to the possible external contaminants, risk of acquiring infections is reduced. Relatively small scar : Since the keyhole surgery involves a small opening it leaves relatively very small scar in the body. Though procedure times are usually slightly longer, hospital stay is less, and often with a same day discharge which leads to a faster return to the routine life.